A highly successful, veteran police detective is made to testify against fellow cops. He's forced to retire, he loses his pension, his family, and is then caught up in a bank heist. Wounded in the shoot-out, he is taken to the hospital, where he limps away with millions hidden in his leather trench coat. Find out how, in the fascinating police drama Metamorphosis In Blue. About Richard D. Ward (Author) : Richard D. Ward is a published author. 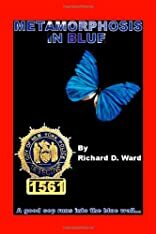 Some of the published credits of Richard D. Ward include From Blue to Crimson: Metamorphosis In Blue II, Metamorphosis in Blue.